Posted by Joe Ross on January 30, 2015 at 1:08 a.m. The Strangest Idea in Recruiting You’ve Ever Heard. And Maybe the Best. A young boy growing up in the city of Yaounde, about 50 miles off of the western coast of Africa and less than 150 miles from the equator, had dreams of growing up to become a professional athlete. Though his athletic abilities were evident from an early age he was inclined against the most popular sport in his country: soccer. Rather, his heart was set on volleyball. Not taking for granted his natural propensity for the sport he worked hard to hone his skills. He walked to the gymnasium in his hometown and began spiking volleyballs over the net for hours every day. This commitment endured for a period of five to six years. Yet in that gym basketball goals lined the walls, silently standing watch over the work ethic of the young man below who would indeed realize his dream of becoming a famous athlete. Only not in volleyball. Call it "Basketball Without Borders". A hypothetical program initiated by The University of Kansas with the goal of bringing basketball to popularity in regions of the world with much less experience with it. Yes, these places do exist and they are mostly located on the continent of Africa, where countless numbers of individuals that are particularly well-suited to the sport have little if any experience with it. One of the reasons why basketball is not as popular as other team sports in Africa is that basketball was not widely played in Britain, France, and Portugal (the major colonial powers in Africa). You may know, perhaps, that team sports like soccer and cricket were introduced to and encouraged in African countries by the European colonial powers. As basketball grows in popularity in African schools and as basketball clubs are formed in the same way that soccer clubs were formed in African cities 50 to 60 years ago you can be sure that many talented basketball players will develop. What better University to undertake the mission of encouraging the wide-spread popularity of James Naismith's creation than the one most closely associated with the inventor of the game himself? Basketball is one of the fastest growing sports in Africa, although it has a long way to go before it becomes as popular as soccer. It will not be surprising in the near future to find many more fine athletes from Africa playing basketball in the U.S. at the college and professional levels. What could expedite the growth of basketball in Africa is a presence that, like the colonial powers did long ago, encourages the development of young players. Africa has produced very reliable and talented NBA superstars and in many respects these players have advantages over their American basketball counterparts. First they are gifted with greater average height. As the link which follows this paragraph points out, some tribes in the Sudan, which yielded next year's number one overall prospect Thon Maker, have an average height of 6'6"! http://www.cnn.com/2012/11/13/opinion/masai-ujiri-africa-basketball/ But they are not just tall. Indeed, as a group they are perhaps the most athletic individuals on the globe for their given height. And more than that, they are very highly disciplined which makes them coachable. As soccer remains a popular sport from East to West Africa, their footwork transfers very well as a skill on the basketball court. Luol Deng, Serge Ibaka, Hasheem Thabeet, Desagana Diop, and three players mentioned above (Luc Mbah A Moute, Joel Embiid and Hakeem Olajuwon) all were indigenous to Africa. More await. Many more. So how would Kansas' involvement impact the continent and what would be in it for The University? Let's take those one at a time. Suppose Kansas established, for example, five basketball schools/offices. (Now before you begin thinking this notion is too far-fetched, consider that the NBA already has a plan to grow basketball in Africa and opened its first office in Johannesburg in 2010. Others have followed.) The NBA is concentrating on South Africa, Kenya, Angola, Nigeria and Senegal, but Kansas could piggyback on some of those targets and open up other areas as well: 1. Nigeria/Cameroon, 2. The Sudan, 3. Congo and the Democratic Republic of Congo, 4. Kenya/Tanzania/Malawi, and 5. South Africa/Zimbabwe/Mozambique. In areas with multiple countries listed, one office would serve the other countries in addition to the one in which it is situated. Suppose we staff those offices with two or three former players each, paying a salary of $100,000.00. If you have your calculator out that's 1.5 million per year. Staff would administer the programs that place basketball goals in schools, create concrete courts, and hold clinics on the rules of the game. They would also promote camps which teach skills and hold intramural games. Importantly, they would have to emphasize education, because if these players became really good while growing up in the system, the professional clubs in Africa, few though they be, could pick them off. As it stands now, many athletes enter United States universities after having played in club programs because most countries simply don’t have amateur high school athletics. These programs often combine developmental clubs with professional teams. Prospective student athletes must now provide much more extensive written proof that they have not received benefits beyond expense reimbursement from club teams. And those athletes who played on a team that included anyone else defined as a professional will face either sitting out games based on how often they played as a professional or being denied NCAA eligibility altogether. Of the 490 incoming athletes penalized for amateurism violations in 2009, 434 were foreign students. Significantly, staff members could and would also be direct distributors of aid given local citizens, especially those who lack food, clean water, basic sanitation, and education, so that the "footprint" left by the University's offices is construed as positive by the hosting nations. 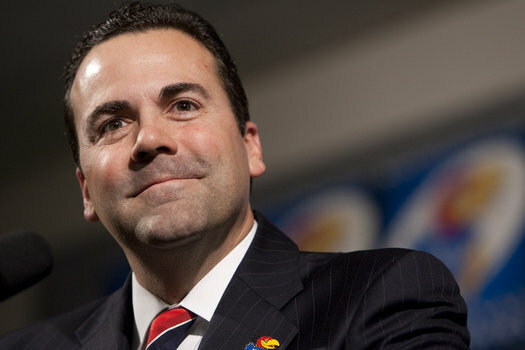 In addition they could liason with other aid providers who distribute charitably to the continent, with Kansas offering perhaps 1.5 million a year in aid, making our commitment to the program somewhere on the order of 3 million annually (LESS than what we pay Coach Self, to put it into perspective). If you read Bylaw Article 13 in its entirety (http://lrbears.athleticsite.net/NCAA/BylawArticle13-Recruiting.pdf), one might despair that this kind of direct aid to potential players could not pass NCAA regulations, as well as an institution acting as an agent on behalf of a University. But one must understand that if these offices encourage students to matriculate into American high schools/AAU programs and NOT into colleges themselves, then the efforts of these offices lie outside of the perview of the NCAA. NCAA regulations apply to "prospective student athlethes" who, by definition, have begun their freshmen year of high school. Yes...prospective players would have to move to America, and this is difficult as it requires the financial means to do so. However, some creative (but entirely legal socially and with respect to existing NCAA regulations) means may be settled upon like having host families agree to house prospective players in America while they attend high school, and then have them enter the recruitment period as Americans. Alternatively, boosters could make direct financial contributions to the families of promising players in the programs so they could afford to send their players to high schools in the States. In any case, new regulations imposed by the NCAA is making it harder to recruit African players otherwise ( http://www.spin.ph/sports/basketball/special-reports/foreign-players-a-vanishing-breed-in-ncaa-as-new-rule-set-to-take-effect-v02) . Is it cheating? Certainly no more so than, for example, building the Wildcat Coal Lodge to give Kentucky a recruiting advantage in offering top-level talent the finest in housing accomodations. In that case, they sidestep the giving of improper benefits to athletes by building a dormitory that houses the athletes in question--the basketball team--and a small number of other students so that it doesn't appear that the athletes got any special treatment, but of course they have and its all legal. More than that, one can make a convincing argument that great talent in the NCAAs serves to increase fan interest and enhances the game. Basketball should truly have no Borders! In any case, the NCAA will never have jurisdiction over what happens in foreign lands, what Universities do there in efforts to bring high school age talent to America, and which students American high schools accept. Then of their own accord, these students can make decisions about where they want to attend college. Those sensitive to the historic exploitation of Africans should consider that many of its inhabitants view American Universities as a dream destination, and that degreed individuals who return to their homeland do so with a higher level of prestige and influence. In essence, recruiting basketball players to the U.S. is an entirely mutually beneficial proposition. Kansas has already been doing well in recruiting, but to the extent possible we should make every effort to bring the best talent to Lawrence, so long as we are abiding by the letter of the NCAA regulations. Clearly other Universities are. Posted by Joe Ross on January 27, 2013 at 9:09 p.m.
Indiana (7) 18-2 Beat Penn State and Mich St.
Ohio State (14) 15-4 Beat Iowa and Penn St.
Kansas (.6901) has a higher RPI than Michigan (.6683), and so their ranking as the number one is not a case of Homerism. Indiana's move up three spots is due to their win over Michigan State and by the losses of Duke, Syracuse, Louisville, and Arizona ahead of them. This should be the first poll of the season where the Blue Devils, neither the Orangemen, nor the Cardinals maintain one of the top three spots. At number 4, Duke still has the highest RPI in the nation. Florida has been completely dominating opponents lately and looks like a team surging at the right time. Gonzaga, Arizona, Ohio State and Oregon round out my top 10. Big movers upward are Wichita State (up 6), Mizzou (I hate to rank them up 7 to 15th), Miami with a statement game over Duke to move up 6 spots, and Georgetown who appear in the poll at 22nd after being unranked last week. Sliders are Louisville, Kansas State, and Minnesota, all of whom lost both of their weekly games. Posted by Joe Ross on January 21, 2013 at 10:18 a.m. The AP and coaches polls are due out today and tomorrow, yet they should not be drastically different. At least, notably, in one respect: the Big 12 is a weak basketball conference in '12-'13. I look for Kansas, Kansas State, Iowa State, Oklahoma, Baylor, and Oklahoma State to all make the tournament, but the latter half of those teams, respectively, are not really resume builders. The Big 12 has just 2 teams in the top 25 and that really shouldn't change all the much during the course of the rest of the season. Yet conference foes are all Kansas has on its slate prior to Selection Sunday. Basically, then, Kansas can't drop two or more games to its opponents if it hopes to retain a number one seed for the tournament. The counter-logic to this is that several other conferences are better represented among the top teams in the country, and they will be passing losses back and forth to each other, which is true to a certain extent. In a numbers game, Kansas seems to have the upper hand. The problem is that in the event of a Kansas loss in the Big 12, it is a worse loss than in, for example, the Big East or the Big 10. Kansas has the personnel to make the run to another conference title, but positioning itself for a number one seed means few hiccups between now and early March. Defeating Kansas State on 1/22 at Bramlage would bode very well. Other big tests are at Iowa on February 25, and at Baylor on March 9. Posted by Joe Ross on July 27, 2012 at 5:53 p.m. The "Jaybate Effect" can be dealt with in ways that please both fans and detractors. If there was something as simple as an "unfollow" option, then those who find Jaybate's rants irritating can skip them altogether. The option should cover both comments and blog entries, so that the pictures he posts may also be side-stepped. This would also allow his fans to keep following him without interruption. There is already a "follow" feature on this site. KUsports would be catering to all people's wishes making for a more enjoyable experience for all parties, and without abridging JBs lengthy, meandering diatribes at all. It seems to be a perfect compromise! Posted by Joe Ross on January 22, 2012 at 9:44 a.m.
Silent requiem for an icon among the world of sports. Football was his life. He lost both together. Any fan of any sport must give proper respect for someone who represents love and dedication to a game so consistently over so many years. Now, that longevity becomes his legacy even as it ends. Joe Paterno. Man. Coach. Icon. Legend. Posted by Joe Ross on December 3, 2011 at 2:25 p.m. Yet another disappointing season for Kansas football. It came and went like clockwork as few had realistic hopes of anything better. True, Turner Gill took us to new lows in 2011, but the fall pattern of Kansas sports is well documented and is not unfamiliar to anyone. Football's frustrations invariably give way to basketball's triumphs and most fans realistically--if not even willingly--accept the fact that we have been relegated to single-sport status. This is the way of it at Kansas. Always has been. So after a season which garnered national attention for embarrassing losses, the overwhelming evidence along with a cursory examination of history should suggest optimism for the future of Kansas football is patently absurd. Memo to Toto: "we are DEFINITELY not in Kansas anymore", at least not the Kansas you are used to. The change has been so slow as to be almost imperceptible, but the fact is that the culture surrounding football is changing among the athletic department and the fans themselves. But think back ten years ago. Fifteen, if you can remember that far. Twenty? Thirty? Kansas has never witnessed a four-year period where the interest generated in football was greater than the last four. In that time Kansas had both its best season--with an Orange Bowl victory in 2008--and its worst (last season), as well as firing two coaches and currently hiring its second. The emotional swings as well as the process of conference realignment, which places a premium on schools' football programs, leads to a change in the way fans even at a basketball school perceive football. So don't lose the forest for the trees. Zoom out and allow yourself to be appropriately shocked that fans GENUINELY care and are armed to the teeth with opinions about the direction of the program. Consider that Kansas...yes, "Kansas"...fired it's head coach after only two years, declaring loudly to all that we are fed up with being bottom feeders. These facts in and of themselves roll very naturally into a changing culture of football in Lawrence, and you can bet that the the urgency and importance of hiring a capable coach in the face of such realities is not lost on Sheahon Zenger. But let me take this a step further. I will put myself out on a limb to say the Jayhawks stand at the precipice of becoming a two-sport school and, ironically, Turner Gill will later be thanked for it (considering how the dismal performances under his watch have driven up passion which will lead to major improvements, beginning with a coaching search that will be much more responsible than last time). For his part, Gill, never an X's and O's coach himself, certainly didn't draw up "improvement" this way on paper, but we'll take it. There is little question but that high expectations for the future of football has stubbornly remained even throughout Gill's troublesome two-year stint. This fact can be credited to the importance of the Orange Bowl win four years ago. Fans and boosters got a taste of a carrot called success and had it rudely yanked away. Simply put, it's clear to see they want it back. Thankfully, our athletic director is a football man and he will make decisions during his tenure that bolster the program at every turn. I'd bet my money that he wants desperately to shed the label of a "basketball-only school". A football AD, a new coach, surging fan and booster interest, great facilities and the emphasis on football across the college landscape may create the perfect storm to build a no-name football program into one with a few things to brag about, thus giving Kansas fans a stake in college athletics all year 'round. Count on it. It's coming. Posted by Joe Ross on November 22, 2011 at 6:23 p.m. Message to Mizzou: “Get the Funk Out”! It's "Kansas City" --- not "Missouri City". Doesn't matter where the state line is drawn. We OWN KC and they can GTFO. Go back to owning the central Missouri part of the state and being used as asswipes for the rest of the SEC. Posted by Joe Ross on November 15, 2011 at 11:13 p.m. Recruiting misses and early departures have really hurt Kansas. Kansas might need to rely more on one-and-done players in the future to remain competitive against other top programs. At times Kentucky looked like an NBA team. Tyshawn Taylor does not have it in him to be the leader of the team. He scores some, but he makes too many mental mistakes and at crucial points in the game. Lack of depth will hurt Kansas, especially over the course of a long season. The Jayhawks execute poorly in the half-court against tall teams. Kansas doesn't have much of a transition game. Makes me miss 2008. The defense is suspect. It breaks down especially with quick passes around the perimeter. It only took a few minutes at the start of the second half for KY to race out to a large lead. Connor Teahan IS the three-point shooting. Period. Thomas Robinson will struggle against double-teams. It's a new look and it's going to take him some time getting used to it. Kansas sorely needs a talented true center. Withey isn't it. Posted by Joe Ross on November 14, 2011 at 2:45 p.m.
West Virginia University didn’t hand out a Halloween treat to the Big East when it filed a lawsuit against the conference in a Morgantown, W.Va., court. Full of legal claims like “breach of contract” and “breach of fiduciary duty,” the lawsuit seeks to allow West Virginia to escape to the Big 12 without having to serve a 27-month mandatory waiting period required by the Big East’s bylaws. I’ve explained previously why the Big East might enforce this provision. There has been a “material breach” of contract. WVU alleges that the Big East and its commissioner breached their fiduciary duties to the university by failing to keep the Big East a viable football conference. WVU’s performance under the contract has become “impossible or unreasonably burdensome” because the university contends it has always valued the strength of the Big East as a significant football conference. The principal purpose of WVU entering into an agreement with the Big East has become “substantially frustrated.” This means that although WVU could still perform under the contract, its purpose in entering into the contract has been destroyed. That a new conference agreement was made between WVU and the Big East when the Big East accepted a $2.5 million payout from West Virginia when it told the conference it was leaving. That the 27-month exit provision is an “unreasonable restraint on trade,” meaning WVU believes the provision isn’t necessary to protect the Big East’s interests. However, the Big East can be expected to argue that during the 27 months WVU will remain a member of the conference there will be eight football members, as other defectors Pitt and Syracuse will also be held in the conference through the 2013 season as part of the 27-month requirement. In addition, the BCS has confirmed that the Big East will remain an BCS football conference through the 2013 season. Another argument by WVU is that even if the bylaws are valid, a new agreement was struck with the Big East for immediate withdrawal upon payment of $2.5 million. WVU claims the Big East accepted the new agreement by accepting the payment. However, the Big East requires such a payment be made when a school notifies the conference of its plans to exit, with another $2.5 million to be paid by the time a school exits. Without additional evidence from WVU on the new agreement it claims was reached, it appears the Big East could argue WVU was only remitting payment as required. West Virginia’s final argument is that the 27-month withdrawal period is an unreasonable restraint of trade, one that is unnecessary in order to protect the Big East’s interests. Here, attorneys likely will point out that the Big East has already waived its right to enforce the 27-month notice period because it allowed TCU out of its commitment; essentially, the conference can’t hold one school to the 27-month period and not another. Big East Associate Commissioner John Paquette said Tuesday afternoon that the Big East had a separate agreement with TCU that stated if it left before competing, it would not be subject to the 27-month provision. Paquette said Monday evening that he could not reveal whether WVU voted in favor of the 27-month withdrawal period in the bylaws when it was added. But he did point out: “David Hardesty, the former WVU president, helped write the current withdrawal policies.” Expect the Big East to bring this up in its response to the lawsuit. The case is important, because it will likely decide the Big East fates of Pitt and Syracuse, which are bound to stay through the 2013 season before heading to the ACC. Although each of those schools could file suit in their respective states, Washington, D.C. law (where the WVU suit will be heard) would govern, according to the Big East bylaws. So any decision in WVU’s case would create precedent for any case filed by Pitt or Syracuse. Additionally, any decision rendered by a court in this case could impact future conference realignment involving any other conference. Although the decision wouldn’t have to be followed by courts in other jurisdictions, it could be persuasive. No doubt WVU is gambling on the Big East settling the case before a decision is rendered which could impact conference realignment for years to come. Posted by Joe Ross on November 14, 2011 at 1:15 p.m.
After Gill, Should Zenger Show Henrickson the Door As Well? Bonnie Henrickson's teams have languished in mediocrity and low expectations for most of her seven seasons at Kansas, but with such a bright light focused on a powerhouse men's program, she has benefited from skulking about in the shadows. With all of the talk swirling around what many assume to be Turner Gill's second and final season at Kansas, a fair question that should be raised is whether or not Henrickson deserves the same fate. Henrickson, like Gill, is an upstanding individual who can be counted on to run a clean program. However, like Gill, the performances of her teams have done little to impress Kansas fans overall. 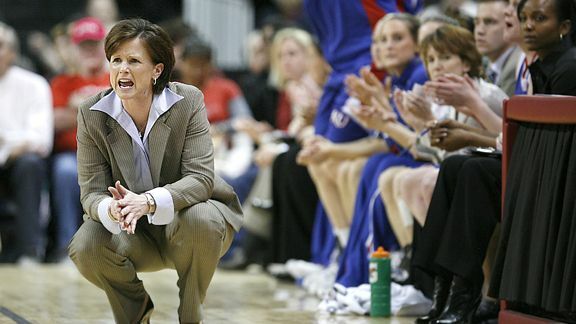 While those who support Henrickson may argue that she has had more competitive teams in comparison with theTurner's squads over the last couple of seasons (including an appearance in the WNIT title game in the 2008-09), they would certainly lose the argument about whether or not Bonnie has had enough time at Kansas to influence the direction of the program. Make no mistake, this is truly Bonnie's team and she has had the time on campus to have turned around the program if she were going to. It would seem to me to be completely disingenuous for Zenger to fire Gill, which 70% of Kansas fans think should be done at season's end, and not at least visit the issue of Henrickson's performance as head coach. In 7 seasons at Virginia Tech, she led the Hokies to a 158-62 record, including 7 Post-season appearances. In every season, Virginia Tech won 20 or more games. Her resume at Kansas for an equal number of years shows Henrickson's record at 117-108, 5 post-season appearances and only 2 plus-20 win seasons. She has had difficulty getting the Jayhawks into the NCAA tournament, however, as just 2 of her post-season appearances were distinguished by this feat. Most of the wins that come the way of the Jayhawks are not in conference, a fact which drives a thorn into the flesh of any would-be women's fans. Quite simply, we are not in the discussion of competitive basketball programs in the Big 12. It becomes a question of what the University values. Do they emphasize character development and running a clean program? Or do they value wins? Personally, I wish they could find coaches for both men's football and women's basketball that would do both.